Democratic presidential hopeful Beto O’Rourke congratulates Netanyahu on his reelection. 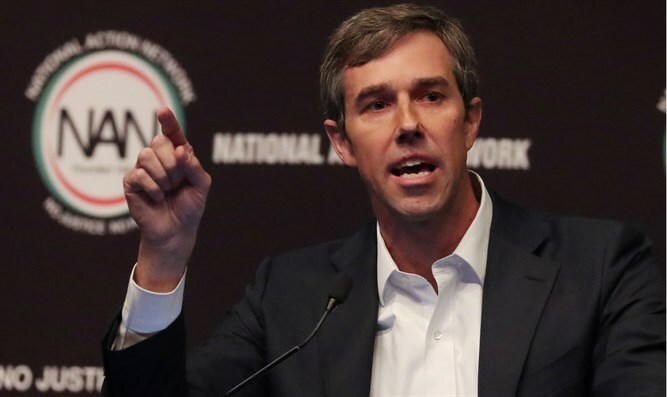 Former Texas congressman and Democratic presidential hopeful Beto O’Rourke congratulated Prime Minister Binyamin Netanyahu on his reelection as a week after calling the Israeli leader a “racist”, JTA reported Monday. “Let me begin by, this is my first public opportunity to do this, to publicly congratulate Prime Minister Netanyahu on his victory,” said O’Rourke in video posted Sunday on Twitter by The Hill newspaper. The video was apparently taken while the former Texas congressman was campaigning in South Carolina. “I may not agree with a lot of what he has done or said, especially recently aligning himself with far right, very hateful parties employing some very racist rhetoric, disavowing functionally the two-state solution ― which if you care about Israel, and I deeply do, is going to undermine and jeopardize a peaceful, secure future for that state,” O’Rourke said in the video. “So I have some serious differences, but our differences should not hold us captive to being able to advance our cause, which is a two-state solution. Our friendship, which is historic with the state of Israel, which must transcend who’s in power at a given time or the party affiliation of the president of the United States,” he added. O’Rourke last week appeared to suggest that Netanyahu is racist. Speaking in Iowa City, O’Rourke stated that the relationship between the US and Israel must transcend “a prime minister who is racist.” Asked in if his criticism of Netanyahu risked alienating supporters of Israel, O’Rourke drew a distinction between support for Israel and support for Netanyahu. He also asserted that Netanyahu does not represent either the best interests of the US-Israel relationship or a path to peace in the region. The comments marked the second time that O’Rourke has taken aim at Netanyahu. Last month he accused the Israeli leader of “openly siding with racists” and using anti-Arab demagoguery in the 2015 Knesset election.